The Koenigsegg Agera RS1's removable roof can be stored in the space under the hood of the car. NEW YORK -- Koenigsegg is striking the monster throttle with the release of its latest model, an Agera RS. The 1,360-horsepower V-8 dazzler is named "RS1" by the father-son duo who commissioned it. It's part of a limited run the boutique Swedish carmaker has sent to the U.S. Most of its offerings, like the Regera it showed last month in Geneva, stay in Europe or the Middle East. 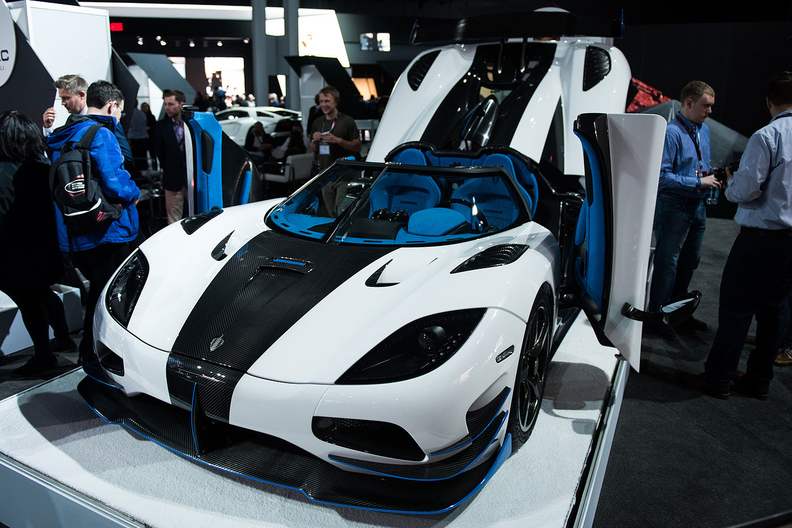 The previous 25-unit Agera RS line, unveiled in early 2015, sold out more than a year ago. The RS1 garnered plenty of attention at an auto show devoid of any huge exotic debuts, minus the Dodge Challenger SRT Demon and a few other sports cars. It's hand-built in Sweden, and runs a cool $2 million and change. Most impressive about the low, stealthy RS1 is its weight: Less gas and oil, it weighs 2,845 pounds, or about the same as a pair of Thoroughbreds. The number is especially impressive because the car still comes with many creature comforts, including climate control, entertainment and navigation, and a hydraulic lifting system to help the car clear curbs steep grades and other bumps in the road. The weight savings in the Agera help get it to 100 kph (62 mph) in 2.8 seconds, with more than 1,000 pound-feet of torque pushed through its seven-speed automatic transmission. Top speed is 439 kph (273 mph), and horsepower has been boosted by 200 hp since the original RS. It can even hit 1.8 Gs around corners -- equal to what the Demon can do as well. Inside it is covered with blue Alcantara trim and polished carbon fiber edging that matches the "Arctic White" and blue accents on the front winglets, side skirts, diffuser and rear wing along the outside of the car. It doesn't look considerably different from previous Ageras, but fans will know it when they see it. And every exterior detail, from the wings to the front splitter and the dynamically active rear spoiler, are purely functional. There is no fluff here. Even better, the removable roof can be stored in the space under the hood of the car. As every good Koenigsegg roof should.